So put your right hand straight up in the air, and give yourself a pat on the opposite shoulder. Because that what you are. A student leader. And you’ve been chosen to come here to represent your school. So turn to two people beside you, give them a high five and say, “I am a Leader”. And one the best ways to show your gratitude is to be grateful for all the numerous blessings that God has brought into your life. Sometimes it’s easier said than to be done. So to help keep me in check, I remember these 5 words. What you focus on expands. On the count of 3, I want you to say these words on the screen. 1, 2, 3……WHAT YOU FOCUS ON EXPANDS. Because if I’m truly grateful for all of life’s blessings, I try to eliminate the negative by accentuating the positive. In other words, if I want positivity to expand in my life, that’s where my focus needs to be. Because, what you focus on………..EXPANDS. So I try to achieve this in 3 ways. Number One. I monitor my language and the way I communicate. Let me show you, I’ll say the negative, you say the positive opposite. See that’s easy. But people use negative language all the time. But if we’re focusing on the positive, because remember what you focus on expands, then your language should reflect that. So let’s look at these statements again. Instead let’s rephrase in the postive………..you read them as they come up on the screen. Let’s focus on the solutions. Even when we tell people what we do, we often use the negative, versus using positive language. We say things like, Don’t forget to bring………when we should be saying, Remember to bring. So that’s number one, MONITOR YOUR LANGUAGE. So every time I touch it, I say thanks things like, “Thank you God for healthy beautiful daughter, or thank you God for amazing teachers and students that support Catholic Student Leadership, or thank you God for One Direction (I’ve actually never said that). 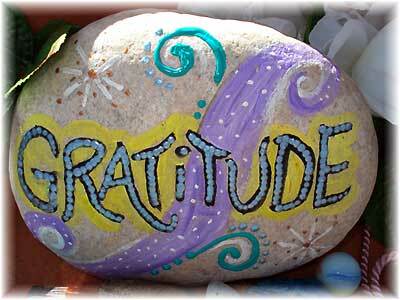 I actually have a few gratitude rocks….. So that’s number 2 – ATTITUDE OF GRATITUDE. And to show your gratitude, you should eliminate the negative by accentuating the POSITIVE. Because, what you focus on EXPANDS. So you should do these 3 things. Number 3 – Be Optimisitic – because if you can be any better, you’d be twins. Awesome. As a parting gift for you all today, to show our thanks for your commitment to Catholic Student Leadership. Everyone get’s their own gratitude rock. So thank you for listening and thank you for being a part of E-CSLIT. I’m truly grateful for your presence.